The Gasthof Grub beer garden is located directly at the Grub S-Bahn about 20km east of central Munich and a 22-minute ride by S-Bahn leaving from Marienplatz. The buildings have existed since 1907 and provided food and lodging for workers of the surrounding farms. Underground, there was also a real beer cellar to cool beer with large ice blocks during the summer months. Although the cellar is no longer accessible, chestnut trees planted on top provide the necessary shade for the still existing beer garden. The beer garden has about 650 seats. Drinks can be bought at the beer stall. The Bavarian food is good value for money and can be ordered with a service staff. 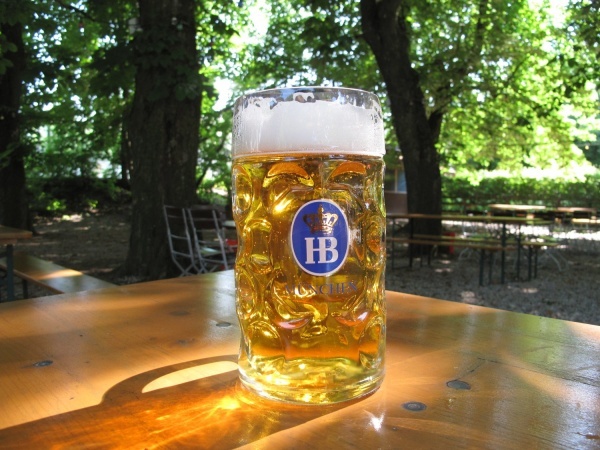 An Hofbräu Helles costs an incredible low €5.90 p/Maß (Mai 2015). A special feature of this beer garden is a small cottage with a grill which can be rented for barbecue parties. The beer garden is open from Tuesday to Sunday between 11am and 11pm (or until the last guests have left). If the weather report predicts especially good weather on a Monday, the beer garden will also be open from 4pm on Monday. The owner will usually announce this a day ahead on a black board. On Sundays the beer garden is already open at 10am.